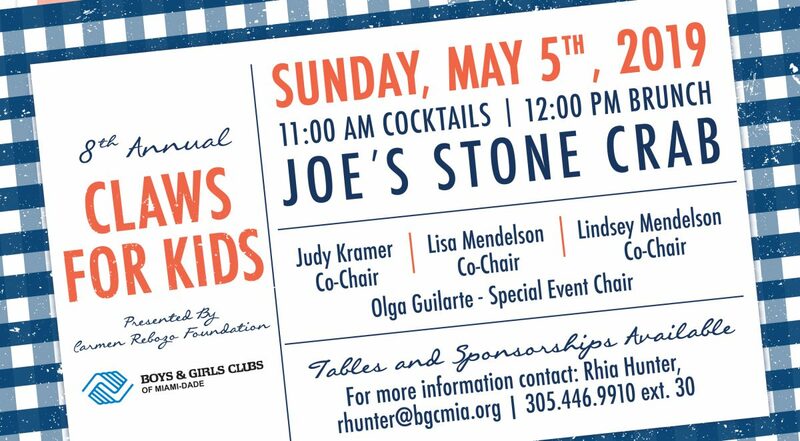 Joe’s Stone Crab opens its doors once again to the Boys & Girls Clubs of Miami-Dade for an exclusive champagne brunch! 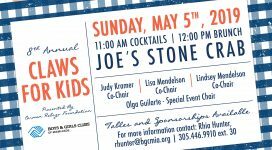 The 8th Annual Claws For Kids presented by Carmen Rebozo Foundation will be held at Joe’s Stone Crab on Sunday, May 5, 2019. Guests will enjoy delicious stone crabs and other signature menu items without the wait. Proceeds will benefit Boys & Girls Clubs of Miami-Dade’s many positive programs, including after school programs, homework assistance, computer training, social skills, dance, arts & crafts, professional mentoring, and summer and athletic programs. The event will kick off with a cocktail reception at 11 a.m., followed by brunch at noon.